Geilir the Mumbling is a Nord warlock and Seer. He is located in his dwelling on the western shore of the island, near the Supply Ship wreckage. He was one of the few survivors of another shipwreck, and cursed the captain, Thormoor Gray-Wave, with eternal wakefulness. Geilir has lost his friend, Oddfrid White-Lip, and wants you to find her. 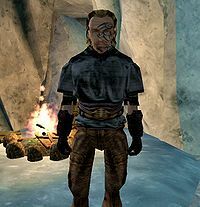 He is wearing a common shirt with matching pants, and a pair of wolf gauntlets with matching boots. Aside from his natural resistance to shock, immunity to frost, ability to shield himself, and a natural frost damage spell, he knows the following spells: Heavy Burden, Great Burden of Sin, Crushing Burden Touch, Weary, Tinur's Hoptoad, Strong Levitate, First Barrier, Strength Leech, Lightning Bolt, Lightning Storm, Alad's Caliginy, Invisibility, Hide, Far Silence, Dire Noise, Fortify Destruction Skill, Fortify Illusion Skill, Fortify Restoration Skill, Nimbleness, Assured Red Wisdom, and Daedric Bite. The Sad Seer: A poor old prophet has lost his head. The Cursed Captain: Help a restless sailor find some peace.